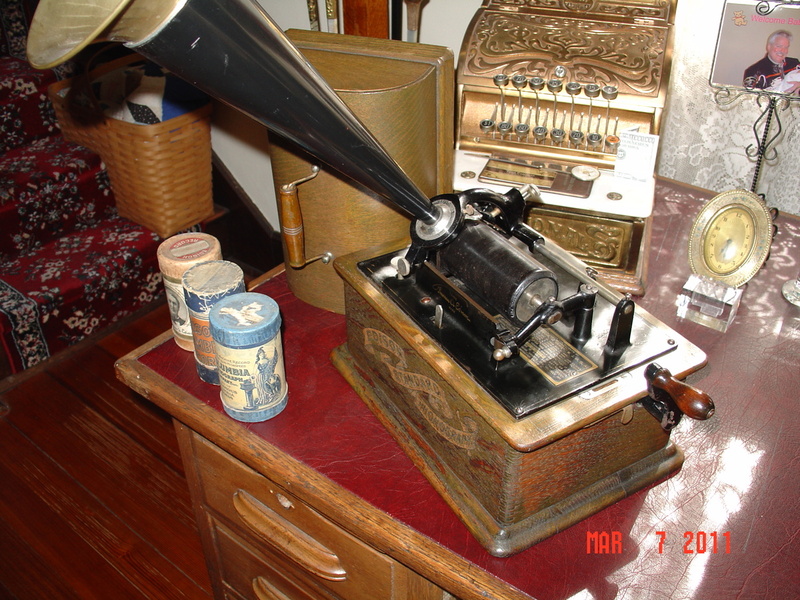 In Victorian Era > Show & Tell and Electronics > Phonographs > Show & Tell. 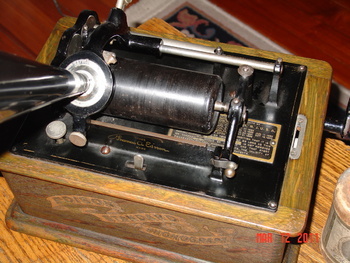 This is a Edison Standard Phonograph playing cylinder records. The cylinders are made of wax. 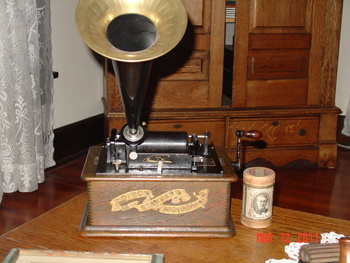 It has a Model C Reproducer. The piece has the lid and crank and 35 cylinder records. This was the stereo back in that period. I've had this over 20 years and it sounds and plays beautifully. The first patent on it is Dec. 4, 1889 and the last on it is Oct. 18, 1892. The serial number on it is s151144. Made in Orange. N.J.,USA. Nice condition, with original decal. Crank her up! Thank you kerry10456 and for the nice comment! Thank you senor_trunk and Vestaswind! Thank you DMK678! How have you been? Your Welcome Your Welcome Your Welcome. Just Kidding Ha!!! I'M Great Thanks For Asking Would You Like To Call Me As I'M So Busy I Still Have Not Gotten To E-Mail You. Thank you AR8Jason! I have a Victrola record player out in the man cave to put on here. It also plays and sounds great. Have a great afternoon! I got a few with the photogragh, but I have found them here and there. I to have a couple of blue also. Most of mine have there cardboard containers that they go in with the lids. Very nice piece. I just picked up today 3 cylinders in the boxes. 2 blue and 1 black. It's nice to see what they would have played on. Thank you hjensen for the comment! Have an Edison and a box of cylinders that belonged to my grandparents. Very nice. I found one very similar to this one yesterday, it belonged to an old relative who passed away years ago. My father had tucked it away for safe keeping, we also found a box with a full set of 24 cylinders last Sunday. I cranked up the player yesterday and it still runs, but I haven't put a cylinder on yet as I have yet to find the horn. It is a beautiful machine, not sure that I'm going to want to part with it. You can still hear it without the horn. Good to know officialfuel, but I'm going to keep looking for that horn. Dad didn't throw anything out, so I'm sure it's here somewhere, thanks. You are so diversified in your collection. Just incredible all the different things you collect. Enjoy looking at everything! Thanks for stopping by William Bridges. You might try putting the name on google and see if it turns up anything. Thank you vinylrecordsaddicted and Designer for the love! Thank you JonesFamily and aycockonxion! Thank you BELLIN68 and dermead for stopping by and showing some love! As always BELLIN68, thank you for the awesome compliment!! so awesome!! I dated a guy who had a player and a huge collection of wax cylinders. I had no idea these were from the 1800s - amazing that it still plays so well, what a treasure! Love it! What a great find. I guess I need to go pick'n with you! Thank you Decogirl1 for the love and the comment! Thank you packrat_place for the love and the compliment! Anytime packrat_place, there's plenty of picking here in Indiana! These are great pieces to own and the fact that is still works is an added bonus, I know you must enjoy it official. Thank you Signaholic for the love! It's sitting on the living room table for everyone to enjoy that comes over! Thank you musikchoo for showing some love on the old player! Thank you mikielikesigns2 for the love on the Edison! Thank you miKKoChristmas11 for the love! Thank you Saxymojo for the love! Thank you blegoff for the love! Thank you spiritinthesky3 for the love! Thank you miike for the love! Thank you eccentric1 for the love! Thank you scottvez for the love! Your welcome-- did yours come in this condition or was it restored? scottvez, I found it in this condition. It still plays well. It's sitting on the living room table for all to see when they enter the room. I love playing for people when they ask. Thank you for asking! Have a great Sunday! It sounds like it found the perfect home to be appreciated! Enjoy it. Thank you filmnet for the love! Thank you musikchoo for loving this again! Thank you tom61375 for the love! Have a great week! Thank you geo26e for the love! Have a great evening! How much would the records alone be worth individually? Thank you danielle2136 for stopping in and asking a questions. I've seen them anywhere from $5.00 -$35.00 depends on condition and if there in the cardboard sleeve. 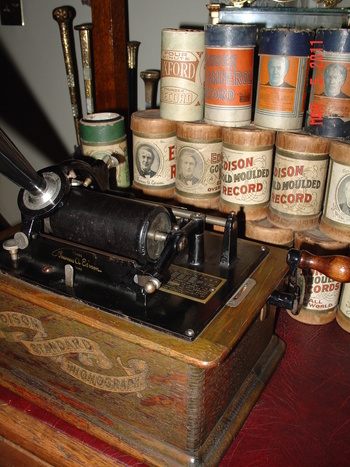 They're called wax cylinder records. They play for about two minutes. Thank you again for stopping in. Have a great day. Thank you Lady_Picker, snowman3, ttomtucker and vintagegirl66 for the love! Thank you PatSea, Kydur and charmsomeone for the loves! Thank you Jewels for the love! Thank you Neighborsguysfan for the love! Thank you roddyq and brunswick for the love!